The Union Minister for Science & Technology and Earth Sciences, Dr. Harsh Vardhan releasing the publication addressing at the inauguration of the CSIR-Indian Institute of Petroleum 4th 3R International Scientific Conference on Material Cycles and Waste Management, in New Delhi on March 08, 2017. New Delhi- Science and Technology Minister Dr. Harsh Vardhan today said that India has been a key player in promoting the efficient waste management system in the world. 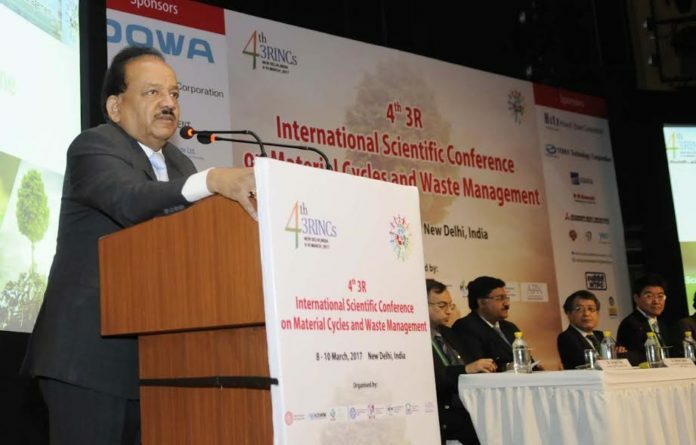 “ Prime Minister Narendra Modi has played a key role at the international platform to develop the sense of waste management and material cycles. Now we need a directional change and positive approach for making a bigger impact,’’ he said. Dr. Harsh Vardhan was speaking after inaugurating the ‘4th 3R International Scientific Conference on Material Cycles and Waste Management’. The conference focuses on promoting techniques of the waste management and spread the concept of Reduce, Reuse and Recycle (3R) principles. Delegates from Japan, Korea and Germany are participating in the three-day conference, organized by the CSIR-Indian Institute of Petroleum (IIP). Chemical and Fertilizers Minister Anant Kumar pointed out that about 4,500 urban areas in the country generate 55 million ton of waste every year out of which only one million ton is converted into compost which ideally should be 5.5 million tonnes annually. 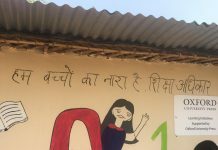 For the first time, he said, the Modi government was giving subsidy for making compost from waste and a 50 kg bag of compost would cost only Rs. 75 for farmers. He announced that his Ministry was ready to ink a MoU with CSIR for setting up a task force for promoting 3Rs. He appealed to use ‘2R (Reuse, Recycle)’ material instead of ‘waste material’. Mr. Kumar said that a Guwahati-based unit was treating two tonnes of plastic waste daily and the plan was to set up 100 such units across the country to give a push to 3R projects. “As plastics are everywhere from automobiles to hospitals and it is not biodegradable, it is a big challenge to contain this menace,’’ he said. The earlier 3RINCs events were organised in Japan (2014), Korea (2015), and recently in Vietnam (2016). India being the fastest growing economy faces an urgent need for solutions towards waste accumulation.